In Monster Lynette Duffy has yet again produced a wonderful storybook that shows her deep understanding of childhood emotions. She has embrace this understanding providing a blend of fiction and reality that helps sooth and heal. 'Ben lived in the country and did School of the Air until one day his parents decide it would be better if he attended school in the city. This meant Ben would attend boarding school as it was too far for him to travel back and forth. Settling into boarding school was harder than Ben thought. The other kids laughed at him because he looked different in his farm clothes and his teachers yelled at him because he could not understand the work. By the end of the day tho other boys were calling him Monster. Monster takes the reader on a journey of feeling different, bullying, right and wrong, change and friendship. This is not only a book for the child but holds important messages for all adults - that of listening to our children, talking of emotions and looking for reasons behind behaviour that may not always evident at first glance. Transition to school, no matter the age or reason, is a difficult time for most children. A time when acceptance and fitting in is important. A time of discovering your place in a new environment and amongst new friends. In Monster Lynette Duffy provides a tool that opens discussion, talking of fears and coping techniques. Used in a school group situation Monster allows the teacher to provide a fictional story that gives a safe place for children to open up to their emotions. Monster is also a great resource for the parent. Read before the school transition it allows for discussion of feelings and coping, then read with the school term it lends itself as a resource that can be used time and time again, providing a non threatening sharing tool that will help assess the possibility of problems and reinforce the child's coping skills. Lynette Duffy has again teamed with Ann Marie Finn who provides illustrations that compliment the story and add a little humour to soften the seriousness of the topic. 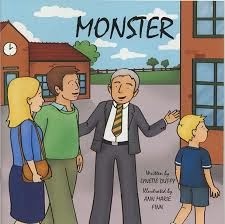 Monster is a resource that should be on all educators and parents bookshelves. Presented on high glossy paper Monster stimulates your touch, vision and emotion.